Going to the Methodist service on the other side of town became a regular event for the Wakefields. Henry wasn’t convinced with what he saw as their revolutionary stance, but he was happy with most of what they said and did, and felt he couldn’t return to Edmond’s church anyway. Sarah disapproved of all Nonconformists but was obliged to obey her husband. In her heart, she remained loyal to the Establishment and everything it stood for and often told Henry so. The children weren’t interested in any of it, tagging along because they had to. Then, one Sunday a week and a half before Christmas a great meeting of Hampden Club spinners and weavers was to take place at the chapel after late morning service. Sarah and the children headed home without Henry who stayed for the meeting. He sat next to [friend] Johnno in the middle of the chapel, both wrapped in coats and scarfs to keep out the cold. People came from far and wide, nearly all on foot. Each man was to give twopence to club funds. Every pew was crammed full. Latecomers sat in the aisle or stood at the back of the chapel. ‘A show of hands of men from Middleton,’ he said. About half the audience raised their hands and cheered and yelled. A much smaller but just as noisy group put their hands up. Bamford named each town within a few hours’ walk known to have a Hampden Club, and an instant roar came from club members of that town. Participants had come from as far as Rochdale in the north and Manchester in the south, from Bolton in the west and Oldham in the east. News of the meeting had been spread by word of mouth, cheaper than posters or putting a notice in a newspaper. The show of hands told organisers informal channels had been a success. ‘I volunteer,’ cried a drunk near the front. ‘Where’s the beer and muffins?’ said another drunk, his mug hanging ready around his neck by a piece of cloth. A mixture of laughter and scorn greeted the comment. ‘Gentlemen, please,’ Bamford said, trying to bring the crowd to order. Henry sat quietly, unsure if he should be there. Several men hooted their disapproval, Henry among them. ‘Many of us are employed by it. All of us are affected by it. It will not go away. What we have to do is gain the support of citizens throughout the country for our impoverished state, so we’ll be strong enough to petition the parliament in London to act.’ He was loud and clear and passionate. A huge cheer went up. Nearly everyone stamped their feet wildly. ‘Men, please. Father Pickering will expel us,’ he warned them. ‘What about the Corn Laws?’ said a man who sat cross-legged in the aisle. As the meeting went on, the men yelled and cheered more and stamped their feet louder. Henry feared revolution would break out there and then, starting in the Methodist chapel in Middleton, with greater repercussions than the revolution in France. He wondered if the meeting would lead to a return to the Luddite days when he was fortunate not to be hanged or transported for allowing machine breakers to use his ladder to get into a factory one night. The crowd was so angry they seemed ready to overthrow the government. Should he have listened to Sarah in the first place? She hadn’t been keen for them to go to a Nonconformist church or happy for him to attend this meeting of radicals. But he thought of his encounter with Father Edmond and his ever declining wage and the abject poverty endured by him and his family. Reform might mean they have some meat with their potatoes, and he could send the children to school more often. Sarah could make them each another set of clothing and warmer winter jackets. He could afford a beer and he wouldn’t have to work every day. But he thought of his landlord, a strict loyalist. If the landlord knew Henry was at this meeting, he would surely be evicted from his house. ‘No,’ yelled the men as one. ‘No,’ was the frenzied response. ‘Yes,’ they bellowed, and clapped madly. While the crowd welcomed the calls for more and more change, Henry thought of how Sarah and others often said people should be happy with what they have. He supported the Nonconformists and reform, but he was becoming a little unsure of this unruly bunch. Suddenly he blurted out: ‘Shouldn’t we be thankful for what we’ve got and be patient?’ He thought it a fair question, but it was met with catcalls from all over the chapel. Bamford tried in vain to bring the mob to order. Shouts of ‘High Tory traitor’ rang out above much jeering and swearing. Men pushed their way towards Henry from various parts of the chapel, waving their fists. The shouting got louder. Someone behind him grabbed his jacket and pulled it hard. He tried to free himself but couldn’t. They pinned him against the back of his seat. He felt a whack on the head and everything went fuzzy, distant, quieter. He disappeared under a surge of angry members. They then lifted him high into the air and he struggled in vain to free himself as they passed him from one group to another above their heads, many of the men now laughing. He got a glimpse of the ceiling, then the floor, and the ceiling again. They hurled him out the door and he bounced and rolled down the steps. His world went black. Henry couldn’t sleep. He lay in bed worrying – about Tuesday, what Sarah would do if she found out their money had been stolen, how he would feed the family next week, the business, how he hadn’t told Sarah he was going to sell it, and where he would get the money to pay his employees, the moneylender, and the landlords of his house and factory. He thought of the scoundrels who robbed him, picturing them in some late hour tavern getting drunk, perhaps keeping company with one or two ladies of the night, laughing and joking. If only he had managed to get to the Cloak and Dagger. He had no doubt a card game would have been on, being payday. And the beer would have flowed, with a pound or two or more added to what might already have been in the till … and the money would still be there. He knew the publican used to keep the takings in his back room, until one night an intruder broke in and his wife got knocked over the head as the man made off with the money. Fearing for her safety, she had made her husband hide the money in the front room, the bar itself, ever since. But Henry knew where it was hidden. He looked across to Sarah’s side of the bed. He couldn’t see her in the pitch dark, but heard her slow regular breaths and occasional gentle snore. His heart quickened at the thought of all the money. The risk was great but he felt he had no choice. He was desperate, surely more so than the taverner could ever be. If he got it, he would think of it as a loan and repay it as soon as he could. To have any hope of getting the money, he first had to get out of the house without waking Sarah. She was a light sleeper and usually woke if one of the children coughed or if a horse rode by. As he eased himself out of bed, he heard her stir. He didn’t move until satisfied she was asleep again. Then he sat on the end of the bed and fumbled with his trousers and boots. But she woke. She didn’t say any more, and he tiptoed from the room, carrying his boots so she wouldn’t hear them on the wooden floor. Downstairs, he took the strongest knife, put his boots on and crept outside. It was so dark he could hardly see where he was going. All the time, he listened for any sign of life, but there was none. When he got near the Cloak and Dagger, he saw the faint outlines of a man and woman staggering along the street giggling. He waited for them to pass. Everything was silent again. He tried the tavern door but it was locked. Henry knew it would be fastened on the inside by a large wooden latch. Using his knife as a lever, he exerted more and more pressure. Just when he thought the knife might break, he heard the latch pop. He pushed the door open and went inside. In almost pitch darkness, he inched his way to the opposite side of the room next to the counter. Slowly he bent down and ran his hand over the floorboards until he got to the fourth one. This was the loose one. Again he took his knife and used it as a lever. The floorboard creaked as it came up. He stopped and held his breath, straining to hear any sound from the back room. He was about to resume when he heard coughing and muffled talking. He froze. The murmurings went on for some time. He prayed they would stay in bed. His legs and then his arms started going numb. Either he had to get up and sneak out or go through with what he had come for. Not wanting to leave empty-handed, he shook the feeling back into his hands and felt along the earth for the till. He knew if he made a sound, he would be caught. His hand came to a box-like object. The lid came off easily and he slowly picked up a fistful of coins, holding them tightly so they wouldn’t jingle. He put them in his coat pocket. The talking had stopped, but this didn’t mean everyone was asleep. Ever so carefully he took another handful and another. He didn’t take all the money as the publican had a family to feed. After he replaced the floorboard, he stood up. His legs wobbled from being stooped so long. He crept towards the door, pushing his hands against his pockets, and out he went. The moment he closed it behind him, he let out several gasps. He leant against the wall until he got his balance. His jacket bulged so much he put many of the coins in his trouser pockets as he walked home but then had trouble keeping his trousers up. Suddenly he saw a figure ahead. He realised how vulnerable he was, with all that money. The figure lurked in and out of the shadows and was carrying a truncheon. Henry saw it was a constable and was about to turn and go the other way, but left it too late. ‘And what might you be doing wandering the streets at this time of night?’ the watchman said. He was unsteady and appeared to have had a few drinks. The constable stumbled off in the direction Henry indicated and was soon gone. Henry couldn’t help chuckling before he hastened along, wondering how much money he had. But it was too dark and dangerous to stop and count it. When he got home he checked up and down the street as far as he could see, which wasn’t far. It looked clear. He transferred all the money to his coat pockets and went inside and upstairs. He took the coat off and quietly laid it on the floor next to his side of the bed. Removing his boots, he accidentally kicked the chamber-pot, causing Sarah to wake up and turn over. ‘I … had to use the potty.’ He got into bed and soon fell asleep. Henry produced a handful of coins and was immediately invited into the office. The owner sat down behind a huge desk and signalled to Henry to sit on one of the chairs opposite. ‘Whisky, Mr Wakefield?’ Thorndike reached behind his chair and took a bottle and two glasses from a cupboard. ‘Yes please, Sir,’ Henry said happily. It was the first time a member of the upper class had ever offered him a drink. He relaxed in his chair and smiled as Thorndike poured two whiskies and passed one to him. He crossed his legs and took a sip with surprising elegance. ‘At the church in Middleton. That’s where the boy was baptised.’ It was a long way to Middleton and Henry didn’t want to visit Edmond anyway. He hoped Thorndike would accept his offer. Henry took another sip of his whisky. It didn’t taste like any old home brew. This was good quality stuff. ‘All right, fifteen.’ He counted out the sum and gave it to Thorndike who put the money straight in his pocket. Henry knew Thorndike was right. They would never believe someone as far down the social ladder as Henry, handloom weaver, over someone like Mr Thorndike, cotton baron, landholder and esteemed citizen. But the cotton baron beamed with satisfaction. Thorndike stopped laughing. ‘Bring me evidence he’s yours and I’ll give him to you. Now, if you’ll excuse me, I’ve work to do.’ He resumed sifting through a wad of papers on his desk – purchases, and orders from buyers throughout England and abroad. Henry swallowed the rest of his whisky, determined to get something for his fifteen shillings, and left. Next Monday, he set off for Middleton for the first time since they moved. He had waited until Monday as he knew Edmond would quite likely be out opening new churches or schools, or campaigning against his opponents. Henry would rather see the assistant who filled in when the minister was absent. He hadn’t been happy to leave Sarah, with the baby due any time. She was still working. Her pay was needed to buy food and other necessities. He hoped she wouldn’t be off work too long, though he was confident Albert would soon get a wage, once Thorndike released him. What annoyed Henry was the month or so it would take Albert to earn the sum Thorndike had taken, and there was his own loss of income while he went to Middleton to get proof of his son’s baptism. In a strange sort of way, he admired the cotton baron. To have that much money and power was something Henry could only dream of. But since his meeting with Thorndike, such thoughts were in his mind more often. As he trekked along the road to Middleton, he pictured himself in a big house, bigger than Edmond’s, with servants and plenty of food, and dry clothes to change into on a rainy day. He only knew weaving though. He was halfway to Middleton, on a lonely stretch of road when, suddenly, two men jumped out of bushes in front of him. ‘This is a stick-up,’ the taller one said, holding a gun at him. Henry took a step back. Henry stopped, afraid to move. He had been held up twice before, but on both occasions had no money and the robbers let him go. This time he had several pounds. But he noticed his assailants weren’t coming towards him and they looked nervous, even more than he felt himself. They seemed unsure, each perhaps waiting for the other to make a move, like they were scared something might go wrong. Henry knew it wasn’t only the upper class who could call people’s bluff, so he decided to take his chances and try and deceive these novices, to keep his money. They turned to each other, not knowing what to do next. He didn’t have to say any more. The robbers hurried off to find the imaginary coach. When they had gone, Henry laughed out loud. He felt proud of what he had done. But he knew he had to be careful as not all robbers were that gullible. He walked swiftly for fear they would realise they had been fooled and come after him. Striding along the roadside, he couldn’t help notice the openness and greenery and fresh air, and the friendliness of the people as they waved to him from their front gardens. These were things he missed in Manchester. Rain was in the air, but he hardly noticed it. He wondered if they would ever return to the country. It was so much nicer than a cellar in a terrace – what with the flooding, and every time a neighbour talked or coughed or cried, day or night, he could hear them. The only thing he liked about Manchester was the Cloak and Dagger. By late morning he reached Middleton. Crossing the stream, he half expected to see his old house perched on the green hillside above the laneway, albeit with somebody else in it. But what he saw was worse, much worse. Where his cottage had stood for so long was a factory, a cotton mill of three storeys, not nearly as big as many in Manchester, but just as ugly. Black smoke billowed into the sky. The stream, where children had played and people got their water, was deserted and the water no longer clear. A high fence now kept unwelcome visitors and stray animals out and, no doubt, orphans in. His house was gone, not a trace left. And the trees had been cut down and the cottages on adjoining properties were gone too. He had seen enough and had to move on, quickly. A little further, in an area that had been open field, was a terrace similar to those in Manchester, where some of the new mill’s employees probably lived. ‘God Almighty, save us from ourselves,’ Henry mumbled, overawed and depressed by what had happened to his home and his town. Why was it that one person could do this and make so much money, and cause misery for so many people? he asked himself. If he had that much money he would at least make sure conditions and wages and living quarters were reasonable. As he walked on, he stared in disbelief at other new mills and terraces, causing him to tread in puddles and trip over roots and stumps on the side of the laneway where trees once flourished. He was almost run over by a horse and cart laden with cloth. Henry didn’t answer, but kept walking. Sometimes he wished he was a peasant, on a remote farm far away from any factory. He got to Edmond’s and saw horses peering from their stables, and the priest’s carriage in an open shed. That meant Edmond was home. Henry was sure he would be confronted by him and be asked why he and his family had walked out of church and never returned, and be lectured on his sins, and be told how the good priest was still engaged in battle with the Nonconformists and the Catholics. It was a daunting thought. Perhaps he could wait until next day and hopefully the vicar would be out. But he had to get back to Manchester as soon as possible to finish his orders. He took a couple of deep breaths and felt ready to face him. As he approached the front door, it opened and there stood the priest. ‘I do hope he’s all right, Henry,’ Sarah said for the umpteenth time since Albert disappeared. ‘It’s been more than three months.’ She was in the armchair mending Henry’s trousers while he sat at the table, wrapped in sacking. Henry got up, poked at the fire with a long rod and put more coal on it as rain beat down on the roof. It was midsummer and while the days had been mild the nights were cold and miserable. One of the children, who had all been in bed for an hour, started coughing. It was Emily. She appeared at the doorway complaining she felt sick and couldn’t sleep. She was weak by nature and susceptible to every epidemic. Her small stature and sickly appearance had concerned Sarah for some time. Sarah jumped up and gave her another drink of water with a dash of gin and more medicine and sent her back to bed. ‘I’m so worried about him,’ she said, resuming her sewing. ‘It’s your fault he ran away,’ she cried. ‘I had nothing to do with it, you confounded woman,’ he said, standing up. ‘Eight shillings a week, Henry. Think of it.’ She knew this would calm him a little. She had no intention of running off to Manchester, of course, and she was sure he knew this. But she had made up her mind to work locally whether he liked it or not. She was sick of the family going without. He sat down and thought of what he might do with an extra eight shillings – go to taverns, buy more food, a new suit. ‘Henry, wake up,’ she said, seeing he was daydreaming. ‘Henry, if it wasn’t for the factories, half the people in all Lancashire would be out of a job. And if people like you could accept them, Albert would still be here.’ She laid down her sewing and put her hands to her face and sobbed. She had been strong and optimistic for so long, through all the wage cuts and the price rises, which in the end meant they could hardly afford to eat, but the disappearance of her eldest son had been her undoing. She had cried many times since he left but never in front of Henry, until now. She stopped crying, put her hands on her lap, and stared at the floor in front of her but said nothing. ‘When he comes back he can do some weaving on a regular basis. It won’t mean more pay but it’ll give him something to do, and I won’t have to work seven days a week.’ Henry hadn’t let Albert or Benjamin do much weaving lately, fearing the merchants would detect a change in quality between his own weaving and that of young, inexperienced boys, and the merchants had thousands of weavers to choose from. ‘What if he doesn’t come back and we never see him again? What if he’s dead, Henry?’ She screwed up her face in anguish and started crying again, only this time she wasn’t worried he saw her. He knelt on the straw matting and put a hand on her knee. ‘Sarah, we’ve got each other and we’ve got a roof over our heads, even if it leaks, and we usually have three meals a day, even if they’re all potato and often small, and we know where our children are, four of them anyway.’ He gave a gentle chuckle each time he qualified what he had just said. He nodded and they closed their eyes and bowed their heads and prayed with all their might for Albert, that he was safe and well and would be home soon. Next day, Sunday, Benjamin left home as usual in the afternoon. He went directly to Charlotte’s house. She was still seeing her aunt, but the other occupants were there. ‘Have you brought us the money, rich boy?’ Nicholas said. Benjamin took the money from his pocket and held it out. Everyone in the room swarmed around him, jostling each other for a better look. ‘A ten shilling note and four shillings in silver,’ said one. ‘I’ve never seen so much money.’ He snatched at it. But Nicholas pushed him aside and grabbed the money himself, before pulling back the sacking between the two rooms. Benjamin looked at him inquisitively, then peered into the back room. ‘Go on, then,’ Nicholas said. It was very dark and Benjamin pointed to the candle. Nicholas nodded to him to take it. Benjamin saw there was someone in one of the beds, but couldn’t see if it was Albert. He went closer, and saw a face. It was still and the eyes were shut. For several seconds he studied it, searching for a familiar trait. ‘I can’t tell,’ he said. Gently Benjamin peeled off the bedding and saw the right arm draped over the midriff. Dumbfounded, he stared at the body before him. It was dressed in street clothes and a bit smelly, but he could see it was Albert. ‘He’s still recovering from last night,’ Nicholas said. Benjamin stepped back as his brother stirred. The eyes opened, slits at first, trying to focus on whoever it was in front of him, then suddenly wider, startled. Benjamin, almost as alarmed, returned the look, nearly dropping the candle, while Albert pulled the blanket up over his head. Benjamin glanced at Nicholas who gave him a threatening look and tipped his head towards where Charlotte usually sat. ‘It was …’ He didn’t want to inform on her, but he would rather face her than Nicholas and bullyboy George. ‘… Charlotte,’ he finally whispered. ‘Don’t dare say anything to the family. I’m happy doing what I do. I don’t want to go back.’ His face was sweaty and grimy and glowed in the candlelight. Albert got up. To Benjamin’s surprise, they were the same height. Being two years younger he had always been several inches shorter than his brother. He watched as Albert ran his hands through his hair and put his boots on. Benjamin had never been to a tavern, even during the week, let alone on a Sunday. They went up the steps to the street and walked a couple of blocks before Albert led them into a laneway between high buildings. It was dark and narrow and strewn with rubbish. They came to what Benjamin thought was someone’s workshop. Albert did a certain knock. The door opened and a man, the owner, waved them inside. There were two other men, customers, at a counter in a small room. Benjamin heard a woman’s voice and a child crying on the other side of a partition and presumed this was the bedroom, and the bar probably the man and his family’s living room when the tavern wasn’t open. The pair sat at a table in the corner. ‘Two specials,’ Albert said to the owner, who went behind the counter and poured a dark-coloured liquid from a barrel into two glasses. Just the thought of what might be in it made Benjamin recoil. He sniffed his drink, but the room was full of so many others smells, he couldn’t tell what was in the glass. ‘Charlotte thinks you’re a man. She’s told me about you. I think she likes you.’ Albert sipped his drink. As he swallowed it, he screwed up his face and gasped for air. ‘What did you put in this?’ he called out to the publican. ‘It’s even worse than usual.’ Albert grinned and had another sip, a bigger one, and nearly fell off his chair. Benjamin had seen enough, pushing his glass further across the table. ‘I’ll tell Charlotte you’re a coward,’ Albert said, his voice rasping. He didn’t doubt his brother’s threat. What he did question was if Charlotte liked him. She had shown no signs. But she was the only girl, apart from his sisters, he had ever spoken to and felt at ease with. He reached over and picked up his glass and held it to his lips. Closing his eyes tightly, he let his top lip touch the drink before he put it down. ‘You’ll have to do better than that,’ Albert said. Benjamin picked it up again and took the smallest sip, though he made it appear he had taken a larger one. His throat felt as if it was on fire. The heat travelled up to his mouth, which he opened wide. He blew hard, half expecting flames to burst out, like a dragon. His eyes watered and became sore. ‘Is that good enough?’ he said and coughed several times. Albert ran through the crowd to the open gate and sprinted across the yard. Those trying to rescue the master and his orphans saw him and called out to him to stop. He paid no attention. At the side of the building, he found an unlocked door, probably the one his father had used minutes earlier. He went inside and felt his way through the darkness, keeping one hand on the wall as he searched for the stairs. The fire, and the light from it, hadn’t reached this area. He kicked his foot against a solid protrusion and bent down and touched a step, then a second one, and a third one. He scrambled up them and got to the first floor. Here it was much lighter, and hotter. He looked down the corridor. Flames leapt about at the other end. He saw an open door part way along and tried to get to it, but searing heat knocked him back. He took out his handkerchief, covered his face and ran headlong for the door and darted inside. The room was full of smoke. A man lay on the floor. It didn’t look like his father – too heavy. He bent down and struggled to turn him over. Then he recognised the face he hadn’t seen in five years. It was much rounder than he remembered. In fact, his father was altogether larger. But it was definitely him. Henry gave a faint groan. ‘Never mind. I’ve come to rescue you.’ The smoke was thick and Albert got down low. They were both coughing. ‘The money,’ Henry said, attempting to get up. ‘No, most of it’s hidden in the desk drawer.’ He pointed to his wooden desk on the other side of the office, but it was on fire, huge flames dancing around on top of it. He went to crawl towards it and Albert pulled him back. ‘I need the money for tomorrow. I’m buying a fine house in the country.’ Henry tried to fight his son off in his desperation. Henry persisted, surprising Albert with his strength, and wriggled closer to the desk. Albert tugged at his father’s legs. Somehow Henry broke free and got up and staggered towards the desk. But the heat was too great and the smoke too thick and he fell back down. Albert shielded his own face with his handkerchief and reached out for him. They were three feet apart and he couldn’t get any closer. Finally he threw the handkerchief aside and lunged forward and clutched Henry’s legs and heaved him back. Again his father got free. To subdue him, Albert sat on his chest and held his shoulders to the floor. But the moment Albert eased his grip slightly, Henry squirmed about with what little energy he had left and got a few inches nearer the desk. ‘You’re squashing me,’ he gasped. They were now almost encircled by flames. The heat became too much for Albert. He got to his hands and knees and crawled towards the door. But Henry called out to him. Albert turned around and looked at him, lying helpless, nearly unconscious. He recalled the time his father had saved him from a factory. He was about to go back for him, but he thought of all the heartache Henry had caused him and the family. Whatever he did, he knew he had to act quickly as the fire was nearly up to the doorway. He realised Henry was at his mercy and decided some hasty bargaining was in order. He slid along on his stomach, got next to him and jolted him hard. The heat was becoming unbearable. Albert put his arms around Henry’s chest and pulled him a foot or so towards the door. But he glanced up and saw wild flames crisscrossing the doorway. He knew they were both doomed. He realised his mistake. Had he not spent time bribing his father, they may have got out. There was no response. He put his head down and kept an arm around his father as they lay on the floor. He shut his eyes. Suddenly there was a loud thump. Next morning at six the workers arrived and went upstairs. He watched as Perrywinkle placed some fibre in the mule. It was working and spinning began. Henry breathed a sigh of relief, the force of which must have been felt by all in the room. He was about to go downstairs when he saw one of the women unsteady on her feet. She started giggling, and that was as bad as talking on the job as it distracted the other workers. She lost her balance and nearly fell into one of the machines. The master was busy at the far end of the floor and didn’t see what happened, so Henry rushed over to her. ‘What’s the problem, woman?’ he said. She looked up, silent at first, then burst out laughing. She was drunk. Should he lay her down in a corner to sleep it off? Or send her home? Or dismiss her? He didn’t think highly of drunken women. Once, soon after the family moved to Manchester, Sarah had a bit too much gin. He had bolted the door so nobody could come in and see her, and warned her he never wanted to see her like that again and made her go to bed. He told the children she had a headache. This woman had come to him with plenty of spinning experience, but had a liking for drink. Out of his respect for the working class and the goodness of his heart, he would give her a chance to redeem herself. He helped her downstairs and led her to the store. She didn’t say anything, just laughed and lay down. ‘Charlie boy,’ she said, running her hands over his body. ‘Oh yes, I’ll cooperate.’ She laughed again. Henry lost his footing and slipped over onto the cotton bags and lay beside her. Suddenly, there was a man’s voice nearby. Perrywinkle reached down and rolled her off. She was quite heavy. Henry got up and straightened his jacket and dusted down his trousers. A bottle of gin, having evidently fallen out of her clothing, remained on one of the cotton bales. ‘You’re dismissed,’ Henry shouted at the woman, but she didn’t seem to care. He picked up the gin bottle and she lunged at it. He gave it to her and bundled her out into the street. Now he would have to find another spinner. In the days that followed, he wondered if he would ever complete his first order. He was supposed to have yarn ready for the merchant before long, but he’d had nothing but trouble. The mule broke down again. He found a new spinner, but two apprentices got sick. He had to take out another loan to meet the first week’s wages. On top of that, the lender came to collect an instalment on the original loan. The best Henry could do was give him Sarah’s and the children’s pay as part payment. This meant he had no money for the house rent and not much for food. Somehow he got most of the order ready on time and the merchant came to collect it. But the man wasn’t one of the big merchants and had no money until the weavers he would sell the yarn to paid him for it. Henry was given an IOU. He now couldn’t pay the wages and he knew his workers would be irate. It was late Saturday afternoon and they were expecting their money before leaving work that night. He sat slumped at his desk, wishing he had never gone into business. At six o’clock a dozen sweaty faces appeared at his office door. There was no escaping. 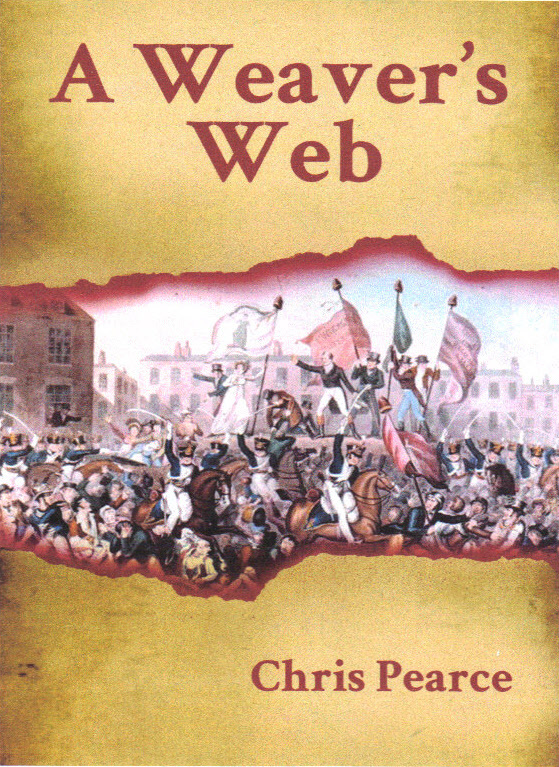 My historical novel A Weaver’s Web is available at Amazon and elsewhere. Earlier, Sarah had made her way home. She stood near the steps to their cellar and glanced up at the apartments above street level. Wouldn’t it be nice to live in one of those, she thought, but they couldn’t afford it, especially as she was expecting next month and would be unable to work for a while. It had been raining and that meant their house, in a terrace built along a natural gully to save money, would be flooded again. She descended the dozen or so steps to the door. The bottom step was ankle deep in water. Weary, she pushed the door open and went inside. She saw the mess. The front room floor had several inches of dirty, putrid water. Most of it had run down the steps and the rest had seeped through the walls. Henry had pulled the loom apart and had stacked it on top of the table. The benches had gone over on their sides, though the armchair was still firm on the floor. She noticed both chamber-pots floating near the back room. These items were well used – the nearest privy was fifty yards away at the end of the terrace, had no door, stank, and the landlord charged families a shilling a week to use it. Sarah knew a woman who used it without paying and the landlord took her to court for trespassing. Ignoring it all for the moment, she waded to the back room where she made out Emily sitting on a bed minding Thomas and Catherine who were both asleep. The floor sloped towards the front of the house, so the back room was slightly dryer. And that was where the family lived – or rather sat on beds – when it rained. But this room flooded too if the rain was hard or lasted long, and with no window it was stuffier than the front room. That day, much of the back room floor was under an inch of water. ‘Has your father gone to the Cloak and Dagger?’ she asked Emily. ‘In the morning, before the rain.’ Emily coughed several times. She had coughed all winter. Sarah was relieved she hadn’t succumbed to something more serious. Sarah could have sat at the table and cried at the sight of the murky water covering the floor, but she was stronger than that. She took her pinafore from the trunk and got the bucket. Wading through the water, she scooped up a gallon or so and went outside and up the steps, pouring it into a ditch in the street. She did this several times. Soon exhausted because of her condition, she called Emily and made her take the bucketfuls up. They were careful not to fall in the hole Henry had dug as a drain at the lowest point of the front room. So far, it was only a foot deep by a foot wide and made little difference to the amount of water on the floor. But he had promised to dig deeper, to three or four feet, and wider, like the drains residents in adjoining cellars had dug. An hour later the water was much shallower and confined to the area around the well. Sarah emptied it, filling the bucket several more times for Emily to take outside. Then Sarah got the mop and sponged the floor dry before sweeping it with a broom and covering the hole and relaying the mats. It was hard work for someone heavy with child. She was thankful the rain had stopped and no more water was coming in. She and Emily struggled to move the loom parts back to where they belonged so the table could be set for supper. It was mutton and potatoes, which Sarah boiled in a pot on the hearth. Emily, who would get plenty of practice as assistant mother in coming months with the impending birth, woke Thomas and Catherine and brought them to the table. Sarah worried about Benjamin. He was normally home before this. She dished up, putting his meal on the edge of the hearth where it would stay warm. They were eating supper when he came in. ‘Oh dear, my poor Albert.’ She put her hands over her face and trembled. ‘Did you speak to him?’ Her voice was slow and wavery. ‘Did you get caned again?’ Thomas said smiling. Benjamin got his meal from the hearth. He ate ravenously and asked for more, but there wasn’t any. Soon after he finished, he was nodding off to sleep. Sarah jolted him and made him rub a special ointment on his injuries, one she had made from plants they collected. She heard more rain outside and hoped it wouldn’t be heavy or prolonged. When it got to eleven o’clock, he [Benjamin] and the driver set off in the carriage to pick up Ellen and Charlotte from Ellen’s house. Benjamin sat up next to Jacob, something he didn’t normally do when Henry was there. As they approached her house, he saw Charlotte waiting outside. He was relieved to see her dress almost touching the ground and her boots couldn’t be seen. The driver stopped the horses and Benjamin jumped down. ‘How are they?’ he said to her. She was about to hitch up her dress and show him, but he waved to her not to, and poked his thumb over his shoulder in the direction of the driver. Charlotte scrambled aboard, first sitting on the step and then swivelling around and standing up on it, before entering the cabin. Ellen appeared, and fastened the door behind her. She gathered her dress and with some difficulty climbed into the carriage and sat down. Neither had been in a carriage before and they marvelled at the posh interior. Benjamin leapt in and they set off. The women gazed out the windows at the people and traffic and buildings, hardly saying anything. ‘Here’s your two shillings,’ he said to Ellen. She took it and smiled. Within ten minutes, they arrived at the Wakefields’. The carriage pulled up and they got out. Charlotte and Ellen were again awestruck, this time by the house, palatial by their standards. A welcoming party had gathered on the front steps. Benjamin led his guests to his parents and brother and sisters, stopping just in front of them. Ellen and Charlotte stood behind him. But he said nothing, and residents and visitors stared at each other. At last he breathed in, held it a second, and spoke nervously. ‘This is Charlotte, and this is her aunt, Mrs Frawley,’ he said. There was silence. He could see his father inspecting them. His mother looked as if she wanted to speak, but perhaps didn’t want to be first. And the children were sullen. It was Sarah who finally came forward. ‘Won’t you come in,’ she said with a sweeping movement of her arm in the direction of the front door. Initially no one moved. Then Benjamin took a couple of steps towards the house. Ellen and Charlotte did the same, but were quite tentative. Their clothes were shabby though clean. Henry, in his Sunday suit, kept staring at the pair, especially at Charlotte, unsure if she was good enough to be keeping company with his son and be seen about town with him. It made her feel uneasy. And he noticed Mrs Frawley’s mouth was caved in and apparently toothless. Fancy arriving at someone’s house for dinner without one’s teeth in, he thought. Once inside, everyone stood awkwardly in the hallway. Benjamin hoped Charlotte wouldn’t sit on the chair and take off her shoes, like she had done in his dream. Instead, she stood motionless and goggled at the size of the hall and its luxurious furniture and decorations. Sarah did an apologetic little cough and forced a smile. ‘I’ll see if dinner’s ready.’ She hurried to the kitchen. Sarah took them into the dining room and showed them to their seats, Ellen between Charlotte and Benjamin. ‘It’s a roast,’ Sarah said. There was no reaction. Instead, the children, no longer used to people of lower class appearance, gaped at the visitors. Henry glared uncertainly at Charlotte, then at Benjamin and back at Charlotte. Emily looked at her disapprovingly. Both guests just gazed around the room. Sarah hoped dinner was nearly ready. Next day, Sarah and one of Mr Halliwell’s workers took shoes and boots, a trestle and a box, and found a spot at the market. They set up a stall. She lined up the assortment of footwear on the trestle and sat on the box and waited for customers. Several people had a look, some picked up boots or shoes and put them against their feet or tried them on. Later that morning, she sold her first pair, to an elderly man with bare feet. They weren’t a perfect fit but he was happy with them and she watched as he shuffled off in them. She had made a sale. She was in business. It was nothing to rival Henry’s, but it was hers and she was proud of it. Sales were slow though and by the third day she brought some sewing with her. But by the end of the first week, she had sold ten pairs and made five shillings for herself. The weeks and months passed. Occasionally Emily was at the market and came and sat with her. She would see Alice too, and of course Albert. One day Sarah was sewing when a towering dark shadow appeared right in front of her. She looked up far enough to see it was a large person in grey. Her eyes went higher. By the time she got to the waist and the chest, she knew who it was. There was no escaping. This would be the end of her. She forced herself to look at the shoulders and the head. As soon as she saw the face, she closed her eyes tightly, hoping the figure was just a brief hallucination from her past. She opened them again but it was still there. ‘Miss Brody,’ she said in a barely audible voice. ‘Sarah.’ Brody seemed equally surprised. ‘I can explain.’ Sarah tried to push herself back, but she was already against the wall. Sarah felt a little less tense. ‘But I’ll tell you what.’ Brody leant further over the trestle and right over Sarah. She slumped on her box. ‘Yes, you will.’ Brody hung over her like a huge storm cloud getting closer and more menacing. Sarah fell off her box and onto the pavement where she lay on her side and brought her legs up towards her chest and trembled. For a few harrowing moments, she feared for her life. At last Brody stood upright again. Sarah stayed on the ground, but partly sat up. She didn’t want to sell shoes or anything else if someone was going to take half her profits. She was sure Brody would somehow find Albert and harm him if he didn’t agree to pay her half his wage. And Brody might keep coming back to her for more money. This would be her last day at the market, she decided. In future she would stay home and help Martha and Alice, when they wanted her to, and only go out to pick flowers and plants and visit the little church. She would find things to do. Perhaps the children could help her with her reading, or even Henry, if he ever had time. She wished he would come past right now and scare this woman away. Then she recalled Henry telling her how Brody had taken money from him every time he visited. She stood up and smoothed her dress. ‘Come on, where can I find him?’ Brody said.